In a Nutshell: Like any great American city, Chicago is defined by its people. Chicagoans are committed to supporting the fabric of the city by starting businesses that spur growth and provide meaningful employment. One initiative leading the way is Benefit Chicago, a collaboration innovating the way impact investments support social enterprises. In two short years, Benefit Chicago has raised $83 million toward its goal of $100 million and continues to work with its partners to support the businesses and people of Chicago. Today’s 24-hour news cycle tends to lead to a certain measure of disillusionment. Turmoil takes so many forms all over the world and is so prevalent, that the good nature of humankind often goes unnoticed. Take Chicago, for example. Many people might immediately think about the way in which Chicago’s crime rate is portrayed. And, sure, like every large American city, the Midwestern metropolis has concerns in that realm. But the Windy City has much more happening than you’re likely to hear about if you live outside the area. Make no mistake: human beings are doing good to help each other all over the world. And in Chicago, organizations are working together and actively bringing positive change to their communities by supporting local businesses with impact investments. These investment loans strengthen the communities in which they’re located by stimulating economic growth, and most importantly, creating jobs. At the center of strengthening Chicago communities is Benefit Chicago, a collaborative initiative that connects impact investors with local businesses who need their support to grow. To clarify, Benefit Chicago provides loans and investments, not grants. It targets mission-oriented investors looking to invest in established, local businesses which meet certain criteria (more on that later). 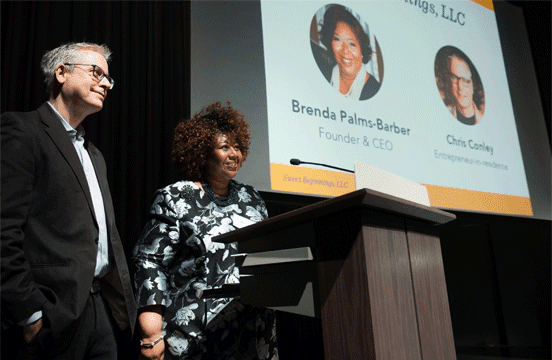 Brenda Palms Barber is CEO for Sweet Beginnings, which received an investment from Benefit Chicago. The initiative got its start and continues to get support from three well-established foundations that have helped to hone its mission and garner the resources necessary to meet its goals. The Chicago Community Trust, the John D. and Catherine T. MacArthur Foundation, and Calvert Impact Capital have all played pivotal roles in the mission. The aforementioned three organizations collaborated their efforts and philanthropic expertise to create Benefit Chicago. These organizations have nearly 200 years of collective experience within the social sector of Chicago and possess an intimate understanding of the needs of each community. The MacArthur Foundation has dedicated $500 million of its assets solely to impact investing. Meanwhile, The Chicago Community Trust has been working in partnership with local organizations to improve the quality of life in the region for more than 100 years. Partnerships with The Chicago Community Trust, MacArthur Foundation, and Calvert Impact Capital enable Benefit Chicago to do more to improve the city through social investment. Playing its part, Calvert Impact Capital helps to move capital into communities in need all over the world. Its Community Investment Note is a fixed-income product that helps fund mission-driven organizations and enables investors to direct their funds. While still relatively new, Benefit Chicago has already invested in six local businesses. Towns told us any one of them serves as an example of the initiative’s goals. One example is Sweet Beginnings, LLC, a for-profit subsidiary of North Lawndale Employment Network, that offers transitional jobs to area residents facing barriers to employment. The company makes the beelove® family of products made with raw honey from local apiaries located across the region. Another example of Benefit Chicago’s efforts to help communities is AutonomyWorks, a digital marketing campaign management service. AutonomyWorks is a company that provides meaningful employment for adults with autism. It contracts with national and international companies that need detail-oriented employees to help support their online marketing efforts. 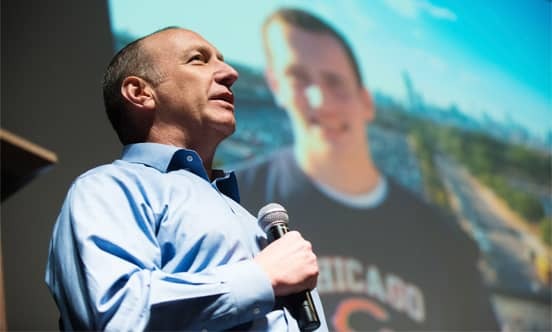 David Friedman, CEO of AutonomyWorks, has helped the autistic community contribute more to Chicago. Something that differentiates Benefit Chicago from similar funds, is that instead of solely investing in nonprofits, it focuses its efforts on social enterprises — these can be nonprofit or for-profit organizations that address a basic unmet need or solve a social problem through a market-driven approach. Benefit Chicago aims to invest in the most impactful areas possible and has some criteria businesses must meet to qualify. First, brand-new businesses are not eligible. The initiative requires that a business be in operation for at least three years. This timeframe proves the organization applying for funding has a solid business plan in place and will likely benefit from the investment. It also has a minimum investment of $500,000 and three additional criteria. Benefit Chicago’s actions within the community are already proving to be highly effective. Hundreds of other organizations are working to make the Chicago region a more equitable, prosperous place, and Benefit Chicago has been recognized above the fold for its efforts. In October of 2017, Benefit Chicago received the Innovation Award for Collaboration. Out of 530 nominees, the organization was chosen for the influential role it plays in improving the lives of Chicagoans. This recognition helps to create greater awareness of the businesses Benefit Chicago helps and those people on the front lines of social change and economic improvement. Benefit Chicago also does a great deal to inspire investment within the region. After all, these growing Chicago-area businesses are creating jobs and bringing more money into the local economy, and it starts at home.